FORTUNA, Calif.— In response to a 2012 petition from the Center for Biological Diversity and allies, the California Fish and Game Commission voted today to protect gray wolves under the state’s Endangered Species Act. The 3-1 vote for protecting wolves comes two days after wildlife biologists observed two wolf pups in the Oregon portion of the Rogue River-Siskiyou National Forest that straddles the California-Oregon border. The pups, which are likely to be part of a litter of four to six pups, are the offspring of the wolf known as OR-7, which has made California part of his range for the past four years. 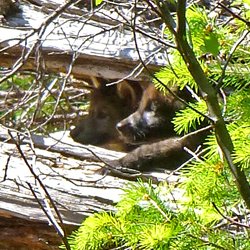 Photo of OR-7's pups courtesy USFWS. This photo is available for media use. Wolves were once widely distributed throughout California but were eradicated from the state by a government-sponsored effort on behalf of livestock operators more than 80 years ago. In late 2011 a young male wolf from Oregon known as OR-7 crossed the border into California, becoming the first confirmed wild wolf in the state since the 1920s. OR-7 stayed in California for 15 months before returning to Oregon, but has crossed back into California several times. After remote cameras captured several recent images of what appeared to be a black female wolf in the same area of southern Oregon known to be inhabited by OR-7, wildlife biologists suspected the wolves had mated, and on Monday confirmed the discovery of two pups. Oregon’s growing wolf population has tripled in the past three years, and it is widely anticipated that more wolves from Oregon will make their way into California. OR-7’s journey to California involved his first dispersing westward across Oregon into the Cascade Mountains, then dropping south into California. Recently the tracks of another wolf were documented in the Oregon Cascades, the first since OR-7.